Wow, I've spent a total of almost 4 hours just today practicing my drums! I feel so alive recently, I think it's because I've gotten back on track with my breathing exercises that really fill me with energy every day :). Yep, that's my practice kit. It allows me to fully focus on my exercise without getting distracted by playing with songs and stuff like I often do when I'm on my electronic drums. 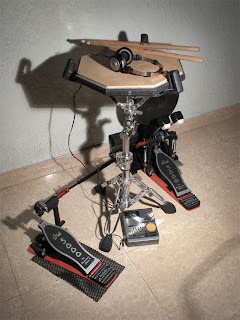 So there you are :) I wonder how this kit will evolve over time so let this be a reference point in my drumming career. Now on to my proper money-making work... see ya!